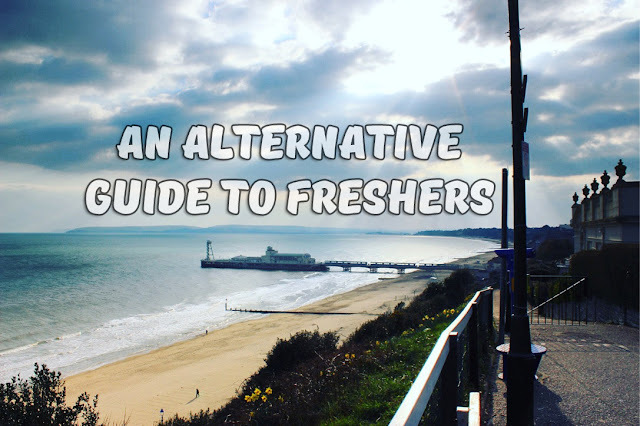 As thousands of prospective 'Freshers' around the country prepare to start university life, I've been pondering on my experience of first year. While I did join in on the early nights out, pretending to be "absolutely loving life", secretly (or not-so-secretly), it just really wasn't my thing. Now, I'm not saying don't get involved with going out with your flatmates or course mates at all, but just make sure you, you know, actually enjoy it. For those that don't drink, drink very little, or just simply find the loud music and flashing lights tedious at the best of times, don't panic. Moving away from home for the first time is daunting without the worry that you won't fit in and while you may wish to brush up on your Ring of Fire skills, here's five other suggestions of what else you can do at uni. 1. Look at your Freshers Pack. While everyone else works out how they'll budget for all those jägerbombs at the Funky Fridays launch night, take a look at what's happening in the daytime during your Freshers week. On ours, we had meet-ups for mature and international students, a social for parents who were starting their studies, day trips out, film viewings and much more. Plenty of opportunities for those looking for something less alcohol-related. 2. Find a house party. Compared to clubbing, they're a lot less claustrophobic, you can actually speak to people, there's no queuing or entry fee and the host will probably put a lot of care into the playlist. I went to some great house parties, including ones where I knew barely anyone, and really enjoyed my night. 3. Start a new hobby. I can't speak for all unis but Bournemouth had so many different clubs and societies. Whether you're into sport, radio, writing, gaming, or something else, you're bound to find a group that appeals to you. We even had societies for Doctor Who and Harry Potter! From experience, these are so great in allowing you to meet like-minded people from various cultures and backgrounds and feel part of a team. 4. Get a part-time job. As well as earning some extra cash for essentials (not just pizza and doughnuts), a part-time job is a great way to utilise your spare time, gain skills and experience, meet new people and gives you something to put on your CV. If you're looking for a place to start, enquire with your Students' Union as they'll most likely be looking for bar, events and promotional staff at the beginning of the academic year. 5. Plan a flat night. If you want to get to know your flatmates better, and feel like you could all benefit from some bonding, suggest you go for a meal or have a film night together. No doubt, even the strongest warriors will be defeated by freshers flu and you providing the remedy will make them see there's alternatives to getting smashed everyday. Whether you decide to go out every night, just a few times, or really don't feel comfortable with doing it at all, make sure you don't isolate yourself. I'm happy I went out in my first year, but my greatest memories were definitely enjoying the company of close friends in an environment where I could actually hear what they were saying. Nearly three years down the line, and I still call those people my best friends, so I'd call that a win. Are you heading off to uni soon? Or have you been and got an alternative way to enjoy Freshers? Let me know in the comments below!